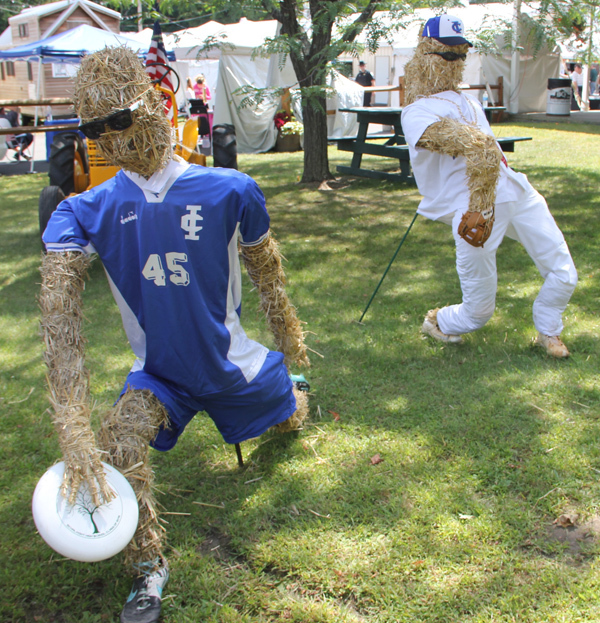 Soccer-playing scarecrows on display at last year’s fair. Individuals, families and groups are invited to participate in the free workshop with Mike DiMisa on July 15 at 9 a.m. at the faigrounds. Award-winning scarecrow maker Mike DiMisa of Ghent will lead a free scarecrow-making workshop July 15 at 9 a.m. in the Show Ring at the Columbia County Fairgrounds at the Route 203 entrance. Individuals, families and organizations are encouraged to attend the seventh annual scarecrow-making clinic. Drawing upon DiMisa’s expertise, participants will learn tricks and tips to create a life-size scarecrow. DiMisa will give a demonstration on scarecrow making, sharing his tips as a local winner of the fair’s annual contest. The event takes place rain or shine. Participants are encouraged – but not required – to enter their work in the Scarecrow Contest at the 2018 Columbia County Fair August 29 to September 3, offering 17 cash prizes. Entries are divided into four categories: Youth (ages 12 and under), scarecrow must be at least four feet tall; Adult (ages 13 and up), scarecrow must be at least five feet tall; Youth Group or Club (ages 12 and under), scarecrow may be any size but no taller than seven feet; and Adult Group or Club (ages 13 and up), scarecrow may be any size but no taller than seven feet. Judging will be Aug. 28 and there is a $5 fee per entry. Scarecrows will be judged on originality, design, creativity, durability and neatness. The contest is sponsored by Trustco Bank. Workshop admission is free but participants are encouraged to sign up in advance by calling the Fair Office at (518) 392-2121 or at columbiafair@fairpoint.net.